Joana from Joana in the Sky with Books nominated us for the Liebster Award. Thanks Joana 🙂 We really feel honored! The Liebster Award is a way to help new blogs with less than 200 followers to gain new followers. 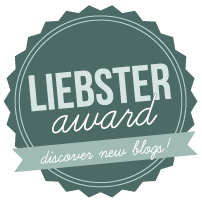 By awarding the Liebster award, we can show our followers that there are other great blogs out there to explore. 2. Do you have any weird bookish habits? Miss Treegarden: Not that I can think of. Darklittle: I like to smell and stroke books, but I think that’s something most book lovers do, right? 3. If you could only read one book for the rest of your life, which one would it be? Miss Treegarden: Tricky question, but I guess I wouldn’t have wanted to miss out on Night Train to Lisbon by Peter Bieri alias Pascal Mercier. 4. Which is your favourite secondary character? Miss Treegarden: Difficult to decide on. I really like Ben’s grandmother from Gangsta Granny by David Walliams. She’s hilarious! Darklittle: Oh dear… I don’t like these decisions. I think it’s Eeyore from A. A. Milne’s Tales of Winnie-The-Pooh. 5. What is your main blogging goal at the moment? 6. Do you prefer series or stand-alones? Darklittle: Until about a year ago, I really liked series, but I became tired of them. Now I really prefer stand-alones! Miss Treegarden: Usually I decide on stand-alones, because I’m eager to experience a great variety of stories. But should I get hold of book which is part of a series and I like it, I am happy to read the sequels and often can’t wait for the latest books to be released. Sometimes, there are books with an open ending and I really wish for a sequel, which might, however, never be published. 7. What made you decide to create a blog? Darklittle: I wanted to share my thoughts on English-language literature. 8. If you could meet any author, who would you choose? Miss Treegarden: This one I know for sure: Roald Dahl. 9. What has been your happiest moment as a blogger? 10. What made you want to start a blog? What is the first book that you can remember “reading”? Do you have a book recommendation for Halloween? What is your opinion on memes like “Waiting on Wednesday”? Do you like them? Do you use them? How do you prefer to read? / Where is your favorite place to read? Which three adjectives would choose to describe your favorite character. Do you think the names of the characters in novels are important? Which place would you set up as a meeting point (fact of fictional), if you got the chance to meet your favorite character. Which book would you like to see turned into a movie? Thank you so much for nominating me! I’m really grateful! Thanks to you, I’ve found some really good blogs to read! Thanks so much for the nomination, I am on the search for blogs. I see some of your other nominee’s that I need to check out. I’m glad you’re happy with the nomination!